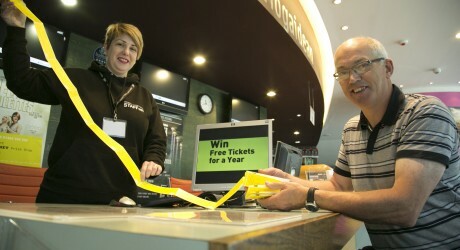 TORQUIL Maclean, the lucky winner of Eden Court’s first Big Ticket Prize Draw, was at Eden Court this morning – picking up his latest selection of tickets. So far this year he has attended nearly 70 shows plus many film screenings, all for free. Eden Court is offering the chance for one lucky person to win free tickets to every show, film and class at the theatre for a whole year. Everybody who makes a donation of at least £5 by 31 December will be entered into the Big Ticket Prize Draw to win free tickets to all events at Eden Court in 2016. Eden Court will also treat the winner and a friend to a complimentary three-course meal in the theatre’s restaurant. Plus, new for this draw, additional bonus prizes of £100 gift vouchers will be announced each month from September to November, giving more chances of winning. “This is an amazing prize whatever kind of arts and entertainment you enjoy,” said Eden Court development manager, Alison Logsdail. The Big Ticket Prize Draw is part of Eden Court’s drive to raise £200,000 a year to help fund the theatre’s work. All of the proceeds of the draw will go towards helping Eden Court bring the best performers and events to the Highlands and supporting their role as the main provider of arts education in the region. Eden Court is one of the busiest theatres in the country attracting around 350,000 visitors a year. Like most arts venues, Eden Court relies on public and private support to help meet its’ costs. To be entered in the draw donations to Eden Court must be made by 31 December 2015. The draw will take place on 8 January 2016. Full terms and conditions are on the Eden Court website. Eden Court is a registered charity and is the largest multi-arts venue in Scotland. It re-opened in November 2007 following an extensive redevelopment programme, which saw the addition of two purpose built cinemas, a brand new flexible second theatre space and two dance and education studios. Eden Court runs the largest creative learning programme of any UK theatre and is the only theatre in Scotland to offer Scottish Qualifications Authority (SQA) courses in Drama and Dance. Pupils from across the Highlands have the opportunity to study at Eden Court for an SQA Higher Dance, Drama or Intermediate 2 exams. Aside from Eden Court, there is only one school in the Highlands where pupils can sit SQA Higher Drama exams. Check out too twitter.com/allInvernessPR and twitter.com/allFilmPR.